OUR STUDENTS' SUCCESS IS WHAT WE ADDRESS! Chris Arthur “C.A.” Jacobs was the youngest of a family of six, born on April 13, 1893, in Sutter City, California. He graduated Grammar School in 1908, Sutter High School in 1912, and Chico Normal College in 1915. In 1918 became the principal of Dixon Grammar School until 1949, after which he taught the 8th grade until his retirement in 1964. 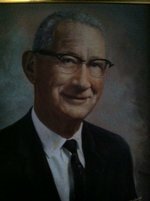 In February of 1964, Dixon Unified School District named its new million dollar elementary school in C.A.’s honor, in recognition for his many years of service to the students of the Dixon community. 1966 – In February of 1964 the school district bought the currently C.A. Jacobs site for a primary school from John Dawson for $18,959.00. The school district built a K-3 school which opened before 1967.